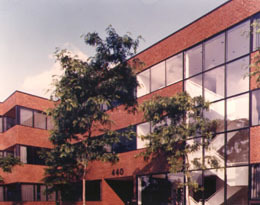 Valley Forge South office building by Miller & Favazzo Properties - quality real estate development and property management. This 150,000 SF development in Tredyffrin Township, just outside of Valley Forge, Pennsylvania, consists of two three-story suburban office buildings and was designed by the Chicago office of Skidmore, Owings, and Merrill. It has a traditional red-brick façade with a monumental stair visible from the exterior.